Our premium railroad transport email database contains accurate information on the sales leads you need to make B2B connections and close more deals. Let our human-verified railroad industry mailing list be the engine that powers your next successful marketing campaign! The railroad transportation industry covers every corner of the country, and it needs reliable vendors every day to help keep business chugging along. 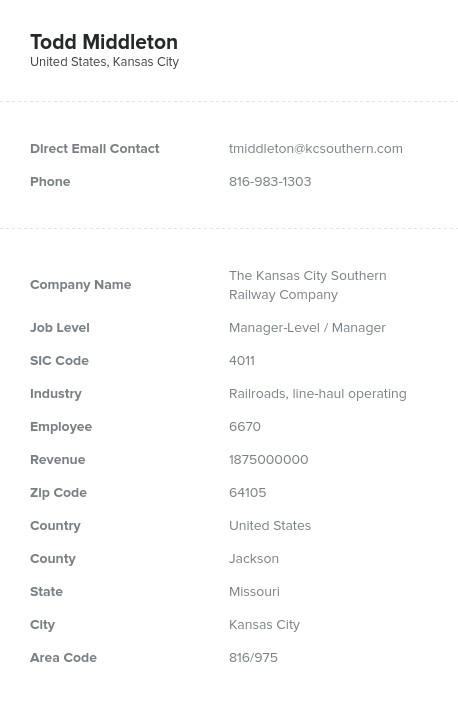 To get your marketing data in front of railroad industry managers and executives, you need this human-verified railroad transport email list. We have the phone numbers, contact names, and other key details you need to push your marketing plans forward! This affordable railroad transportation email database can be the cornerstone of your entire business database. We give you accurate and comprehensive information in this pre-built email marketing list, and we can also help you make a railroad industry mailing list that meets your exact specifications. Whether you need to break down your list by geographic area or contact type, our list-builder tool can help you create the railroad transportation email list you need to get information to your target audience. We authenticate all of our business lists regularly with both computers and real people to make sure that each bit of information is direct, accurate, and up-to-date, so when you buy a targeted email list from us, your marketing efforts won't be derailed by bad data. Our railroad transport email database will help you get your message into the right hands!